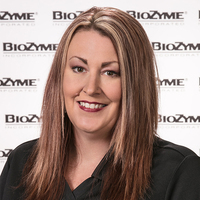 Jennifer Miller is the Director of the Outreach Support Center at BioZyme®, where she enjoys the opportunity to work with the customers to make sure all of their needs are met. She joined the team at BioZyme in 2017. With more than 17 years of managing customer support centers, Miller was instrumental in helping get BioZyme’s Outreach Support Center started in July 2018. When not at work, she enjoys baking, playing darts and spending time with family and friends. She is married to Jamie Miller and has three adult children, Micheal, Christian and Mackinze.